I've blogged a little bit before about "American Men" - stone cairns or markers like the ones at Spectacle Head, Cupids, and at Spider Pond, Spaniard's Bay. Today, I was up to the top of the ridge on the southside of Harbour Grace, to look at a more recent stone cairn, erected by the appropriately named Stone family. I've also come across something of a mystery. I found an article in The Trident newsletter, published by the Newfoundland Historic Trust in February 1974. 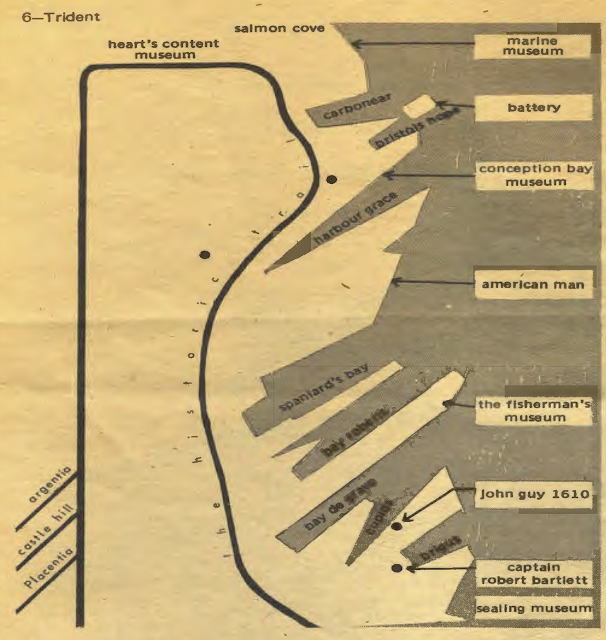 The article features a very rough map that shows an "American Man" somewhere between Spaniard's Bay and Harbour Grace. Dos anyone know of an American Man somewhere in the Bishops Cove-Upper Island Cove-Bryant's Cove area? Or is it possibly an error on the part of the map-maker who has placed the Cupids American Man in the wrong place?